In stock -This product will ship today if ordered within the next 13 hours and 18 minutes. 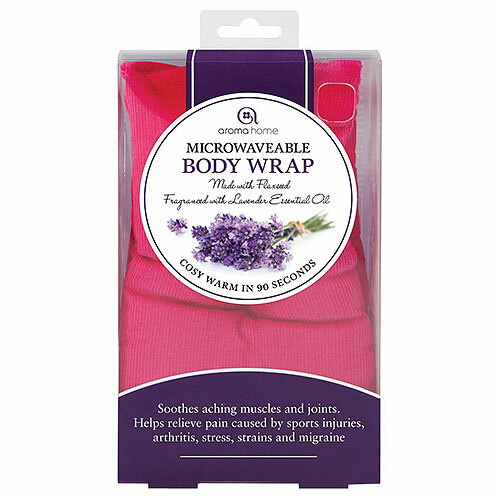 Soothe and relax your body today with Aroma Home`s fuschia microwaveable body wraps. Made with 100% pure cotton, these body wraps are filled with natural flax and Lavender seeds, to create a therapeutic wrap that can be used hot or cold. The soothing body wrap is designed to fit comfortably around the neck, over a shoulder, wrapped around an arm or leg, across the stomach or around the lower back. Whether you`re treating sports injuries, tension or just like to enjoy the textured feel of the flax seed moulding to your skin and subtle Lavender fragrance, this is the perfect treat for you as well as an ideal gift for your loved ones. Use warm on aching muscles, for stress and to relieve joint pain, or chilled to reduce inflammation, ease sprains and bruises and relieve headaches. Fold the body wrap once and place onto a non-metallic plate and place inside microwave open. In the event of overheating, allow to return to room temperature and inspect all seams and condition of the body wrap. Do not use if damaged. Once heated allow to stand for 30 seconds before use. Continue to heat in increments 10 seconds until desired temperature is reached, up to maximum of 2 minutes for 500-750 watt microwaves and a maximum of 1 ½ minutes for 800-1000 watt microwaves. Remove outer packaging and place the body wrap in a plastic bag in the freezer for at least 3 hours. This product can cause burns, avoid prolonged direct contact with the skin. Take care when removing from microwave over as the product may be hot. Inspect the body wrap at regular intervals, discard if found worn or damaged. Clean only in accordance with the manufacturer’s instructions. Consult a doctor before use if pregnant. Not suitable for children under 36 months due to risk of overheating. Not suitable for persons insensitive to heat. The heating of the body wrap should only be carried out by an adult. Allow to cool to room temperature before re-heating. This product contains wheat and may not be suitable for a person with a wheat allergy. Consult a doctor before use whilst pregnant. Below are reviews of Aroma Home Soothing Body Wrap - Lavender Fragrance - Fuchshia by bodykind customers. If you have tried this product we'd love to hear what you think so please leave a review. This product is ok but there isn’t enough filling so consequently it does not keep hot for very long. 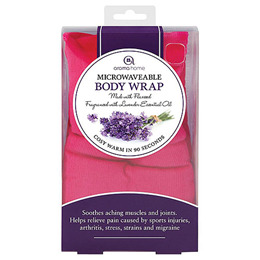 Soothe and relax your body today with Aroma Home`s fuschia microwaveable body wraps. Made with 100% pure cotton, these body wraps are filled with natural flax and Lavender seeds, to create a therapeutic wrap that can be used hot or cold.